Festos is the second largest Minoan palace after Knossos and has a majestic location overlooking the Mesara Plain. It was an important religious, administrative and economic centre during Minoan times. During the Archaic, Classical and Hellenistic periods, Festos was independent, but its previous status was greatly decreased. The city state was defeated in 220 A.D. by Gortyn and destroyed. The first palace, built here around 1900 B.C., was destroyed by an earthquake in 1700 B.C. Afterwards, the palace was rebuilt on a grander scale and this second construction is what is seen today. 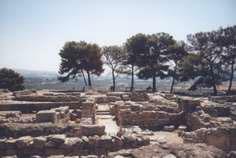 Archaeologists began excavations here in 1900, at about the same time Evans was working at Knossos. The Italian archaeologist Federico Halbherr headed the Italian Archaeological Mission working at Festos. His focus and direction of excavation was completely different from Evans' at Knossos and, as a result, reconstruction was minimal.